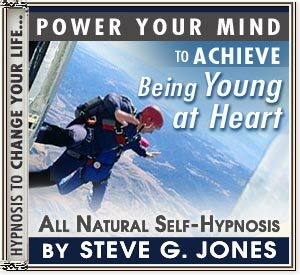 LEARN HOW TO BE YOUNG AT HEART WITH HYPNOSIS!!! Do you want to capture that liveliness that you had when you were young? Power your mind with hypnosis to regain your childlike energy for having fun & exploring life - no matter what age you are now! Dr. Steve G. Jones M.Ed. takes you to the next level, puts the wind back in your sails, and gets you focused on being truly young at heart no matter your age - NOW!! !